A separate, tax-exempt non-profit organization in 1987, and its articles of organization were signed June 1988. This Foundation was designed to award scholarships to those pursuing higher education that would lead to a career in national defense and national security. Funding came from corporate and individual contributions and from fundraising activities. 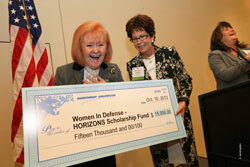 Through the HORIZONS Scholarship, established in 1988, Women In Defense encourages women to pursue careers related to the national security and defense interests of the United States and to provide development opportunities to women already working in national security and defense fields. The scholarship is designed to provide financial assistance to further educational objectives of women who are U.S. citizens either employed or planning careers in defense or national security areas. (This is not law enforcement or criminal justice.) The amount of the awards varies each year. A panel of judges, composed of WID members, considers applications and makes awards once each year. WID is in a key position to shape the future defense and national security workforce. WID leaders and members encourage the study of professions related to science, technology, education, and math that support national security professionals. Undergraduate and graduate students are eligible; undergraduates must have attained at least junior level status (60 credits). Focus of the scholarship is on the following preferred fields of study: security studies, military history, government relations, engineering, computer science, cyber security, physics, mathematics, business (as it relates to national security or defense), law (as it relates to national security or defense), international relations, political science, and economics. Others will be considered if the applicant can successfully demonstrate relevance to a career in the areas of national security or defense. Awards will be based on academic achievement, participation in defense and national security activities, field of study, work experience, statements of objectives, recommendations, and financial need. Awards are made without regard to race, creed, color, or religion. Women In Defense reserves the right to revise, suspend or discontinue this program without notice. Completed applications, essays, recommendations and transcripts must be received no later than JULY 15. Send application packages to: WID HORIZONS, 2111 Wilson Blvd., Suite 400, Arlington, VA 22201-3061. Applicant is responsible for making sure all materials arrive to meet the deadline. Only applicants selected to receive a HORIZONS scholarship will be notified of the results. Recipients will be posted on the HORIZONS Scholarship Award Winners page by the end of September. Please check periodically; no inquiries, please! This volunteer-run organization cannot return telephone calls, and e-mail is limited. Fundraising events and donations from corporations and individuals make it possible to provide HORIZONS scholarships. Tax-deductible donations can be sent to: WID HORIZONS, 2111 Wilson Blvd., Suite 400, Arlington, VA 22201-3061.